Though these are often called Evening Primrose, Sundrops bloom brightly from morning until late afternoon while Evening Primrose is the wild version that blooms late in the day. 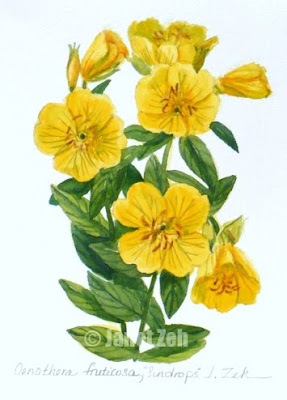 Whenever I paint Sundrops, I must be sure to start early or else they will close up on me before my eyes! With their bright yellow cupped flowers they remind me of large buttercups. TYou can get the print at Prints.ZehOriginalArt.com in the botanical section. Thanks for stopping by today!